Fortified by three domes representing different approaches to religion, Birla temple is a mesmerizing temple carved out in white marble. 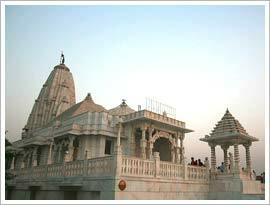 It is popularly known as the Laxmi Narayan Temple and is located in Jaipur, Rajasthan. Thousands of devotees throng in here to pay homage to the almighty. It was built in 1988 by the renowned Birla Group of Industries. They have also built several beautiful temples in other states of India. The temple was named after the Birla Group. Birla Temple is dedicated to Lord Vishnu, the protector of the Universe, and his consort Laxmi, the goddess of wisdom and wealth. Whenever you come to Jaipur do not miss the opportunity to visit the temple and take blessings from the heavenly deities. The architecture of the Birla Temple deserves mention. The exterior of the temple is decorated with sculptures and images depicting the themes from the great Hindu mythology. The sculptures are so meticulously and beautifully carved that it seems as if they are real and talking to you. The walls festooned with the images of Socrates, Zarathustra, Christ, Buddha and Confucius introduce the devotees to the secular nature of the temple. The interiors are dedicated to the mythological proceedings exquisitely carved out in white marble. The shrine also houses several other images of Hindu deities. At night the temple glows in the moon light.